it’s been more than a year since I’ve returned from Portugal but never quite got down to recording it. thought I’d better do it before potentially changing phones. 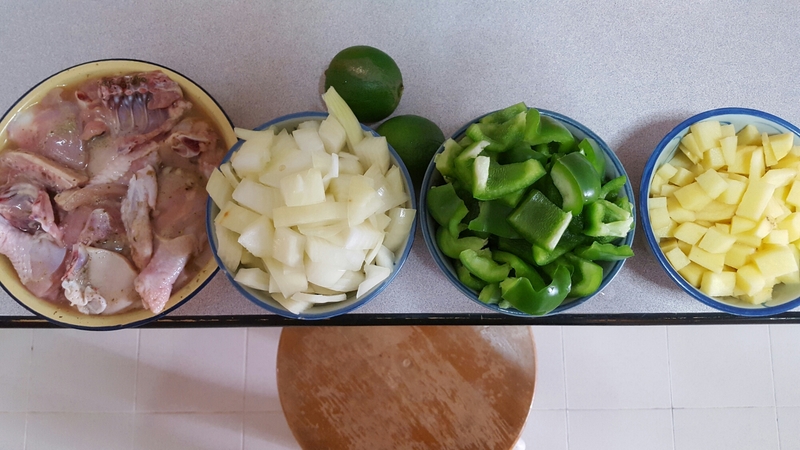 this post features some of the meals I had in chronological order. I can’t say that Portugal is a food haven – food was edible, but not quite what I’d consider delicious. I distinctly remember feeling disappointed with the food while I was there…but it could just have been depression clouding every thing. I originally meant to spend Christmas in Porto, but somehow, when I reached Lisbon, the depression was so overwhelming that I felt I needed to get home earlier. the flight couldn’t be changed online, so I had to go to the booking window at the airport to get it changed. I shortened my trip by a whole week. it seems extremely wasteful, but it was the meaningful choice at that point in time. this was the first meal I had after the fact, where I felt the trip was a lot more manageable. this was a great hot meal at lebre churrasqueira after a morning of exploring Fatima. it was the down-season in winter, so many places weren’t open in the evening. I was rather relieved to find Combo Caffe open serving hot sandwiches. it was my reward after doing the stations of the cross + reaching 16 in ingress. somehow, I remember texting rhodenbarr while I was having this meal. he was the only one from Singapore who was up that late. I had the seasonal special from hamburguer real: goat cheese, walnut and honey hamburger. the burger itself was good, but the goat cheese got a bit much and I kinda regretted my choice. should have ordered the normal burgers hahah. casa piriquita is the most famous sweets shop in sintra, possibly all Portugal. by sweets, I do mean all manner of sweets, from hot chocolate to pastries. I really wished I had company for this meal. I ordered the shop’s specialties, but they ceased to be enjoyable after a few bites because they were too damn sweet. sharing it with a friend or two would have been nice. this fish diner was recommended by our guide of the free walking tour of Lisbon. I happened to hit it off well with a couple on the tour so I had company for this meal. the diner itself is kinda non-descript, and they run out of daily specials pretty quickly! my last meal in Portugal was a bacalhau (cod) sandwich for breakfast at O Trevo. it was rather strange eating fried cod in bread (kinda dry?). it was rather early in the day, and it was a pity that they didn’t have the bifana (pork sandwich) ready yet, or that would have been my first choice. ended the trip with hot wine at the Christmas market, with the winter sun finally showing its face. now I have a craving for hot wine! today marks the final day of operations at the Bukit Merah Public Library. I have many happy memories of using this library – from reading storybooks on the weekends when I was a kid, to grading work there as a working adult, and more recently, bringing my niece and nephew there to borrow books before letting them play at the playground next to the library. I approve of NLB’s strategy to situate the libraries where there will be greater footfall, but last week, as the day of closure loomed close, I couldn’t help but weep for the memories past. I paid a few farewell visits to soak in the place and say goodbye. and look how the niece has grown! I no longer have to read to her; she looks for me when she needs help with a word or two. the adult section is upstairs. see the fantastic Singapore Collection in the corner – these shelves were indispensable when I prepared GP lessons based on Singapore. on one of the visits, a familiar logo caught the nephew’s eye and he snatched it up excitedly. the fictional aisles that gave me tomes of agatha christie and elif safak. I am also deeply indebted to the travel section where I did much of my travel research before free-falling into a new country. and lastly, the loan counter, which has seen many many iterations. frequently, I would hurry through this section because sambal would be waiting for me in the carpark outside, and then he would frown at all the books I’m laden under, and shake his head because it’s obvious I wouldn’t be able to read all that within 3 weeks. thank you for the services and memories you provided, dear bukit merah library. I didn’t think I would be this attached to you, but I guess it is a case of 日久情深. I will miss having you around, and miss exploring your depths full of mystery and adventure and profound sadness. this is the first time I bought (half a) fresh chicken from the butcher – usually I’d only order the breast, thought I’d try something new. marinated in salt, pepper, italian herb mix and a splash of orange juice. I oiled the pan with the chicken skin before sautéing the onions, followed by the peppers (I like my peppers very soft). next came the potatoes and the chicken, and a can of lager. 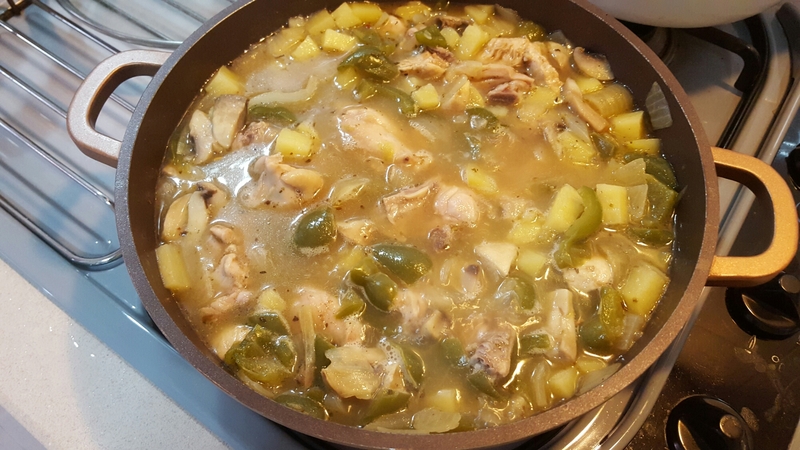 chicken stew! the recipe asked for stout, but I substituted it with a strong brew in my possession that I didn’t enjoy. great way to use up unwanted alcohol. my sister ate my leftovers for dinner and she liked it! hooray. but she prefers last week’s egg-tomato dish haha. 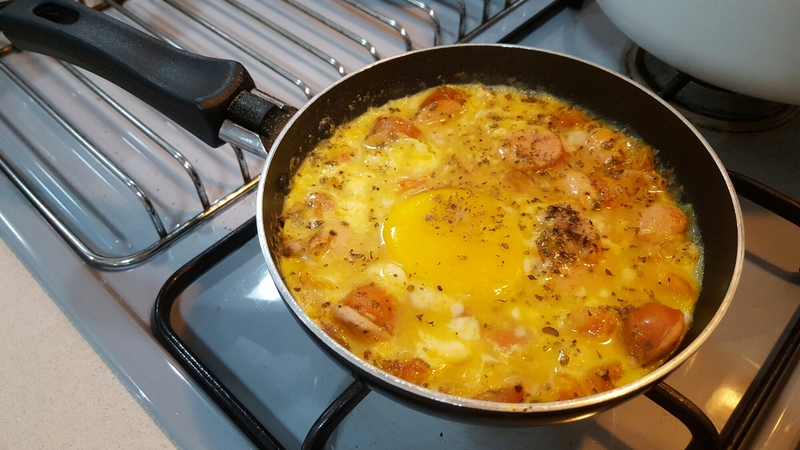 I tried my hand at a basic shakshouka of chopped tomatoes, sausages and runny eggs. definitely an all-day breakfast dish I’d repeat! 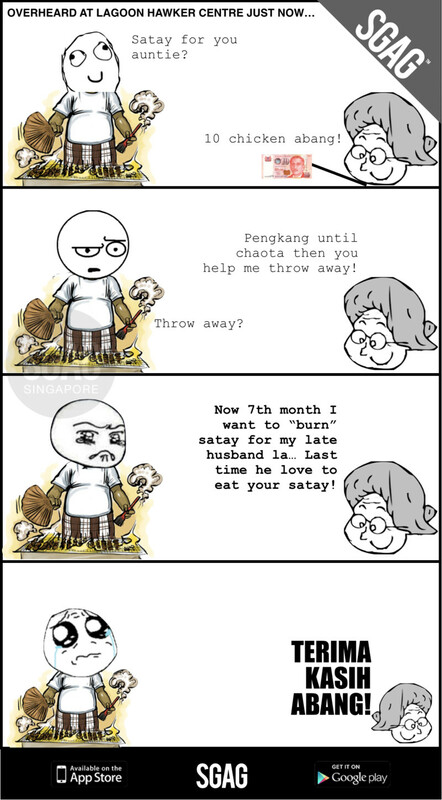 just thought i’d share this touching and poignant strip i saw on sgag. apparently truly overheard by the poster! satay man: satay for you, auntie? auntie: 10 chicken satay, brother! grill until it is burnt then you help me throw away! auntie: now seventh month, i want to ‘burn’ satay for my late husband la. last time he love to eat your satay! thank you, brother! i appreciate the incident also because it demonstrates how love can transcend religious and cultural borders. the satay man here is malay, who tend to be muslim, while the practice of burning offerings to the dead is a taoist one. yours truly here is a christian – but i think it safe to say we are all touched by this little anecdote. will blog about the singapore elections if i ever get down to organising my thoughts. meanwhile, thank you for checking on me. my mood swings and emotional downs have been quite unmanageable of late – i feel so angry all the time and i’ve been punching walls till my hands smart and i don’t understand why. not sure if there is even anything to understand…but thanks for keeping an eye. I’m guessing some foreign readers had their interest piqued by my mention of the Seventh Month in the previous post – quite a number of clicks for the wikipedia link! 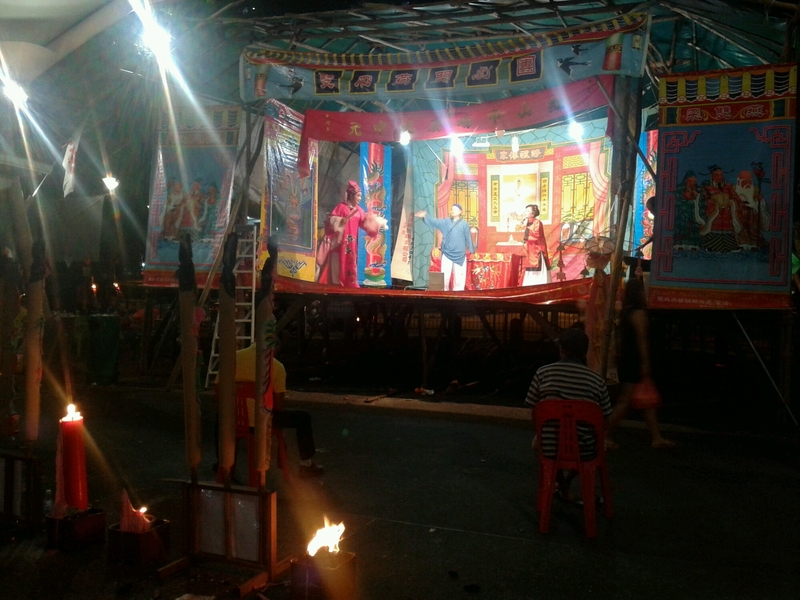 There’s usually entertainment put up for the visiting souls – the traditional one being Teochew street opera on make-shift stages. When there are seats laid out, the first row would be left empty for the ‘good brothers’. In this case, no seats were laid out, but there were decorated joss candles (sustenance for the spirits) and offerings being burnt. 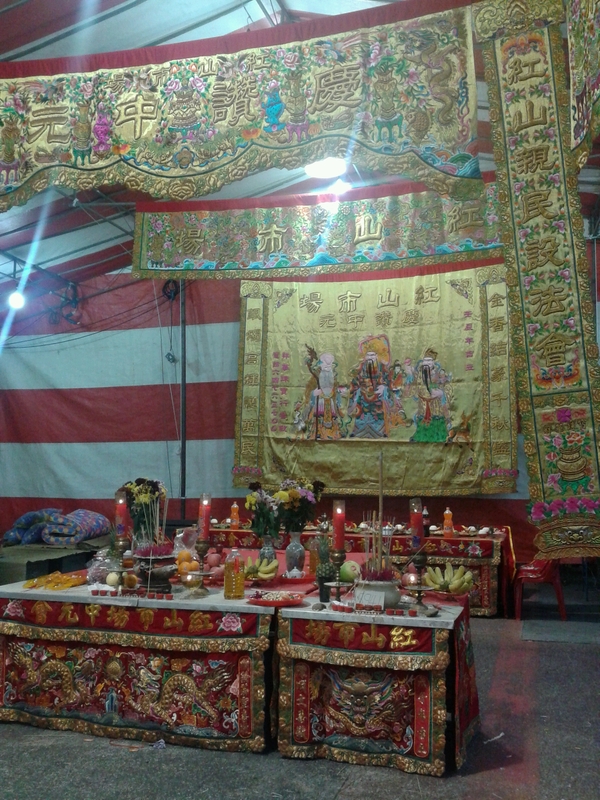 The gods depicted on the banner are FuLuShou – Prosperity, Status and Longevity. This particular ceremony was organised by the Redhill Market association. 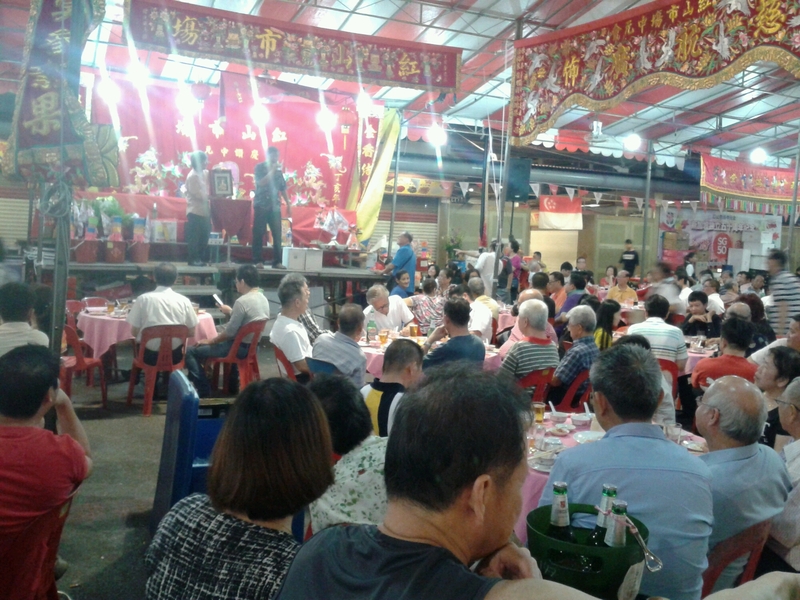 The evening would begin with prayer and invocation of the spirits for their blessing and continued support, thereafter the hawkers gather for dinner and a very noisy auction of auspicious objects. Those objects would have been blessed earlier at the altar and include things like deity statuettes made of gold and pots of blessed rice that you can choose to display or cook. The proceeds from the auction will go toward funding entertainment like the street opera and getai (lit. song stage) for next year’s seventh month. Note the joss sticks sticking out of the rice bowls. This is why we Chinese, no matter what religion we may subscribe to, think it rude (some say inauspicious) to stick chopsticks into rice bowls. It is customary to lay them flat on the rim of the bowl. 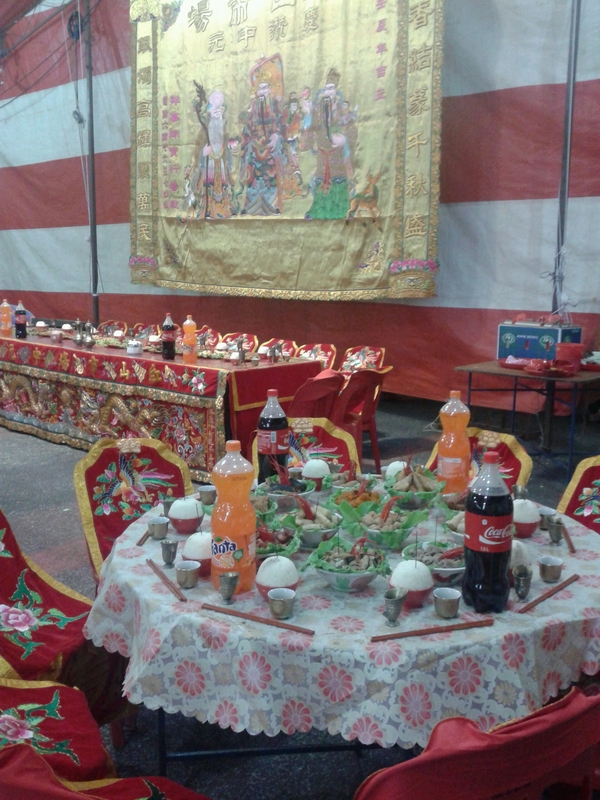 Hope you enjoyed this slice of old Singapore, with rituals that have since died out in China under communist rule. 2. Describe how your chosen ‘setting’ spoke to you. Why did you like it? 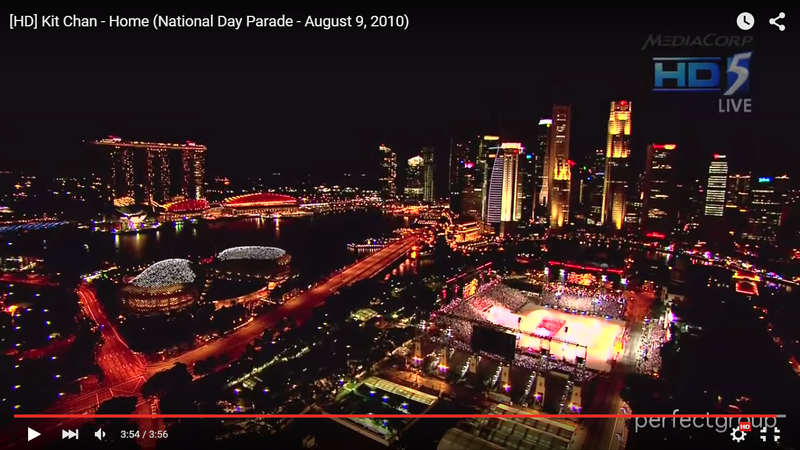 I was on a study abroad programme to the UK when this National Day Parade was aired. I streamed it live over in London so that I could watch it “with” my family, 8 hours apart, and my breath was literally taken away at the skyline of Singapore. Being in London at the time, I revelled daily in the history and architectural marvels of England, always feeling regretful that Singapore had chosen to rid ourselves of many a heritage marker in order to build the modern city. At that moment, though, the glitz and glamour of our Central Business District (CBD) stopped my heart. The irony of me learning in the land of our (ex-)colonisers was not lost on me – sometimes, decades on, we have yet to lose the flawed perspective that the colonial masters are better, even though we have since proven ourselves to be as capable (or more). This video remains one of my top choices whenever foreign friends ask me for a quick introduction to this mysterious land called Singapore (which is NOT in China, by the way. We are a tiny but proud independent nation.) and it usually takes their breath away too. d) share an artwork that shows a ‘setting’ you love and tell us why you love it. e) write a small playscript which highlights ‘setting’. A bare stage, with a backdrop of a forest. A road-end, during a jog. En: Follow the pony tracks! Dan: But that goes…into a forest. We are going to a forest? Dan: Oh. I didn’t expect that. I thought you said a cemetery. En: It is the cemetery. Straight ahead, I think. Dan: I was kinda expecting tombstones, not the woods. En: This was before they realised that land is scarce in Singapore. Dan: By the way, Google Maps says we are standing in a random grey patch. Big random grey patch. You’re the boss now. En: Uh, I’ve only been here twice. I followed wherever the experienced guide went. Hehe. Dan: Now you tell me! You bring me to a cemetery during the seventh month and you don’t even know the place well! En: Don’t worry, just be friendly! After all, these are our forefathers. They won’t harm us. Hehe. Dan: Oh please, take a look at yourself. They will probably think you are incompetent and destroying their hard work. En: Ah. Good point. It’s ok. Just don’t step on any incense or food offerings and don’t step on the graves themselves and it should be alright. I used some Singlish vocabulary and grammar structure in this for authenticity. The seventh month refers to theHungry Ghost Festival, where the realm between the spirit world and ours is open, and the deceased are believed to visit the living. We are in the eleventh day of the seventh month as I write. Thanks for reading!